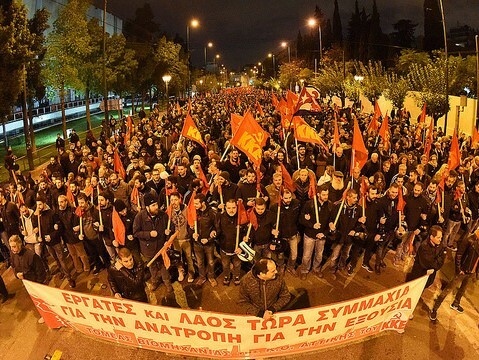 The Communist Party of Greece honoured the Polytechnic uprising with massive rallies all around Greece. The resistance of thousands of workers and students against dictatorship on 17 November 1973 was a turning point which accelerated the end of the US-NATO-backed military junta regime in Greece. And the occupation of the Polytechnic University of Athens, which was brutally suppressed, later has become a symbol of this movement. On the 45th anniversary of the Polytechnic uprising, the Communist Party of Greece (KKE) organized rallies throughout the country. “The aims and the slogans of the Polytechnic uprising demanding the closure of the atrocious military bases, the disengagement from NATO, social, democratic, labour, people’s rights have not been fulfilled today. For that reason, we continue the struggle, until the final victory, forever”. See the link for more information in English, Russian, Arabic and German.